Understanding how this plant grows will help you manage it better. 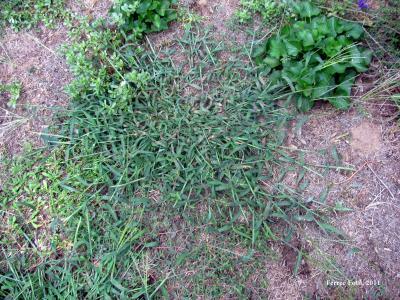 Crabgrass only lives one summer and has to restart from seed each spring. Crabgrass seeds germinate when spring soil temperatures are about 55 degrees for 7 to 10 consecutive days. New plants will continue to pop up until soil temperatures are 90 degrees. Soil temperatures at the Illinois State Water Survey's Peoria weather station show that bare soils warmed to 55 degrees on February 22, but since then have hovered in the mid 40-degree range. If crabgrass is out of control in your yard, you can use a preemergence weed killer to control it before it germinates. The "crabicide" forms a chemical barrier or blanket at the soil surface that prevents crabgrass development from germinating seeds that have absorbed the weed killer. Both synthetic and organic herbicides are available. Check the ingredient statement on the product's label. Corn gluten is an example of an organic pre-emergence herbicide. Organic products require a little more time to break down and need watered in lightly in order for particles to come in contact with soil microbes and begin activation. As the plant proteins of the organic fertilizer (corn gluten) breakdown, a natural plant toxin is released which serves as a partial pre-emergent. This product does not give 100 percent control but is an option for those that prefer organic products.